The yin to Roost Modern Italian’s yang, Roost American presents executive chef Dana Downs’s unique take on cuisine applied to classic Americana. Featuring upper and lower dining rooms, a space for private events, full-service bar along with large patio space, the overall relaxed vibe of the restaurant from decor to plate reflects the suburban locale of Kettering, OH. Open for private events and holiday celebrations. Please contact the restaurant directly for more information. Whether celebrating a special occasion with family and friends or hosting a corporate event, Roost American can accommodate all of your special event needs. Dana is exceptionally skilled in catering, being called upon by many to provide their special events the best experience that can be offered, not only regarding food, but supplying professionalism and stunning visual displays as well. From small events and private parties, to major functions anywhere in the Dayton area, our catering experience brings you an occasion to remember. Whether a graduation, retirement party, reception, reunion, or shower, let us make sure your event goes smoothly and worry free. I am so sad Roost American on Lincoln Park Blvd. is closing. Perfect spot with great food. Horrible service. Concert right next door that the restaurant clients frequent often. Obviously they should know that there was a sold out event that night and be staffed appropriately! Love the outdoor patio seating and the location in the park. Had a great cocktail, pizza was good, but shrimp cocktail was just ok. Service wasn’t great. We waited a half hour before we even got our drinks. Our reservation was for an hour and a half before the concert at the Fraze and we felt rushed once we got our food to make it on time. I would recommend this restaurant if time isn’t important. Awesome location pre-concert at the Fraze. Limited menu and service was ok, considering the place is not open as a restaurant all the time. Awesome fries. I want to love this place, but the service is ALWAYS so BAD. The location for Fraze concerts keeps me coming back, but the food doesn’t and the service is almost enough to give up on it. The service is bad consistently enough that it’s clearly a management problem, not any one (or ten) servers. We dined before the show at the Fraze. Nice atmosphere and the food was excellent -- Truffle Fries, Caesar salad with chicken, Veggie Pizza. Has dinner and drinks before a show at the Fraze. The food was pretty good. .. the truffle fries and the grilled artichokes were excellent. Unfortunately the service was really slow. Extremely slow in fact. It took over 30 minutes to get a drink and when it came, it was wrong. After an additional 20 minutes or so, our food came and finally I got my drink (after we went to the bar to check on it). Our waitress explained that there were several new employees so hopefully it was just due to the learning curve. We will go there again - its a perfect spot for dinner before a show at The Fraze! Beautiful atmosphere and décor. Excellent levels of service that evening even with the Fraze concert rush. Expected a limited menu due to the pre concert event however the selections and variety were excellent. Thanks for taking good care of us before the concert. We requested a table under the awning and our table was waiting for us when we arrived.Thanks Roost American for a great evening before the Allison Krauss concert at the Fraze. Great food, Great service, Perfect night!!!! Our first time to Roost American, the wait staff were friendly, however, a little slow. For Mother's Day, it was a nice treat. Cater to a higher-end customer. Food was good, not great, the buffet offered for the Mother's Day Brunch was not very expansive, maybe a dozen or so items. I might go back to Roost American if there is an event at the Fraze we were attending, I don't think I would go on a regular basis. Good basic experience, I wasn't overly impressed. Roost used to be our favorite restaurant. It is with a heavy heart that I leave this review. Restaurant is only open for special occasions and holidays, we dined for Easter. Buffet was not good, meats were cold and vegetables over cooked. Price was too high, service ( only needed them for drinks) was terrible and then we noticed on bill the added a 22% service charge. We will not be back unless we can order from fabulous menu. Disappointing downgrade from past experience. Food quality was average. Buffet items I had were not very warm. 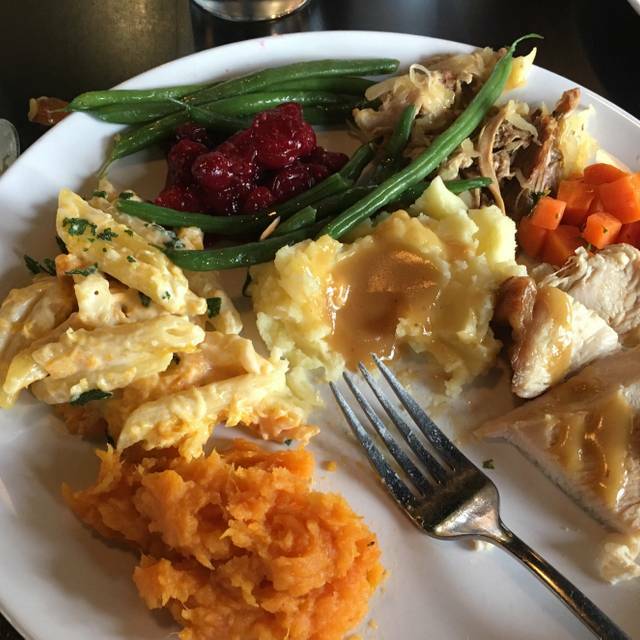 Special Thanksgiving Dinner event - wonderful variety of seasonal favorites with delicious creative salads, appetizers and wonderful selection of desserts. Love the yummy pastas too! Thanksgiving buffet at Roost American. Everything was fantastic. This is a special event restaurant (private parties, holidays and special events) owned by Roost restaurant in the Oregon Distract. Will definitely recommend as a place for your holiday gathering for family and friends. Very disappointed in the size of portions for the price. The wedge was half the size of a normal wedge and it was the smallest piece of cod I have ever seen. In fact I didn't think the fish was on the plate given the extraordinary large serving of potato. A very strange meal, especially given the price. Good food and nice ambience. Bartenders didn’t have good knowledge of drinks though and they doubled as our servers in the dining room . Maybe needed more staff. Food was blah. Roost Italian, the sister restaurant is really good and would highly recommend. The sides to the rib-eye were better than the protein. The price, food, and location make this a big disappointment for me. Skip the new location and go to Roost Italian. Great atmosphere for dinner outside by the Fraze Pavilion. Service and food was excellent and nice wine selection too. Looking forward to coming again. We celebrated my wife's birthday at Roost American with a wonderful evening dinner. Service was excellent and the food - salad, main course, and desert - even better. Plan to return within next few weeks to try other items on the dinner menu. Dinner with friends before a concert. Our reservations were for an hour before the concert...we were late to the concert. We placed drink orders upon arrival, but it took forever to get the drinks served. Long delay on the food orders and the food is, really, just so-so. For the prices on the menu, one should expect much better. Went Saturday night 9/9/17. Seated quickly, never served. Hostess brought us water and told us twice a server was on the way. Plan was to dine and listen to the concert across the street. Ate elsewhere, no concert. Won't go back. Just nothing special here. Food was just OK, and portions were very small. My piece of cod might have been 4oz. It measured about 2 X 3". How is that a main course portion? No bread was offered prior to the meal. They were out of the appetizer I wanted, even though it was early in the evening, and they only have four or five appetizers on the menu. Service was a bit slow. We waited about 15 minutes after we finished our meals for a waiter to bring our check, and another 5 minutes for the cards to be returned. We went here to meet friends prior to a concert, and, even though it's conveniently located for Fraze events, I wouldn't go here again. Went to Roost American before a concert at the Fraze pavillion. Perfect evening. Great food and a terrific dirty martini. We sat outside so I cannot comment on the interior conditions such as noise level and overall ambience. Food was excellent, but as we'd heard from others, service was below average. The excuse this night from the waiter was that they were understaffed. On a concert night at Fraze, how can you NOT schedule sufficient staff??? I was so so disappointed! Our evening was HORRIBLE! Our reso was at 6:00pm and our entire party of 4 was seated out on the patio! We were headed to a concert At The Fraze at 7:30pm. We ordered appetizers that took in excess of 40 min our entree was then ordered. There were 4 other tables out on patio that came AFTER us and was Served BEFORE US! We waited 1 hour 15 min - unacceptable!! Our server provided no explanation or compensation!! They really need to get it together! Arrived a few minutes before our 6pm reservations. Only one host who was slow seating people. We were going to the Fraze for a 7:30pm concert and believed an hour and a half was sufficient, but not here. We ordered right away but food was not brought until 7:09pm so we had to gobble it down. No time for coffee or desert. Food was far from special. Starting with their specialty of onion soup which tasted so bad only ate a few bites. Waiter did apologize for delay in bringing out food for they were short staff. He went and checked on our order and said my pizza was done but waiting on my wife's pork dish and it would be two minutes which turned into 5-6 mins longer. Obviously my pizza sat around for it was only luke warm. It would have been very good if it was not cold. My wife's dish was merely "so-so" and did not finish it due to taste and time restraints. Many restaurants have came and gone from this location and this one will not last long unless they provide better service and better tasting food. I do not mind paying the higher than market cost they charge for food but not under these circumstances. I have been to there other location and service and food were good. This location really misses the mark. I would not recommend this restaurant until they get their act together. Too many nice restaurants out there to ever consider this one. We had friends in from out of state. We wanted to take them somewhere we knew we would get a fantastic meal, great cocktails and could make reservations. Roost fit the bill perfectly! We had a wonderful meal and everyone was satisfied! Thank you! Our server was awesome. Sadly our food was poor. Had the salmon and it was pure salt. Husband had the scallops and whatever that big blob of pasta in the middle was horrid. No flavor to anything besides salt. We love roost Italian and will never come back to this American again. Food was good with fresh ingredients, although the pesto sauce on the pizza was too strong on the garlic. The atmosphere indoors was nice, but I was disappointed when the hostess said there were no available tables outside. My group of 6 had to sit inside by the window and stared at an open table for six the entire evening. Nobody ever sat there. There are enough other good local restaurants that I will probably find one with more helpful staff next time. Had reservation and was seated in timely fashion, however, it took 30 minutes before our order was taken! The drinks were good and they offered a GF menu. When received our order there was no sausage on my... sausage and mushroom pizza! They did give to us for free due to that. Overall, highly unimpressed with the restaurant. However, it is a great place to park the car for Fraze pavilion. Food and service were lack luster for the price of the meal. Disappointing after the visit to Roosr Italian. We probably will not return. We were told that they don't serve bread when there is an event at the park across the street. The Caesar Salad was a joke. $2 extra for the anchovies? 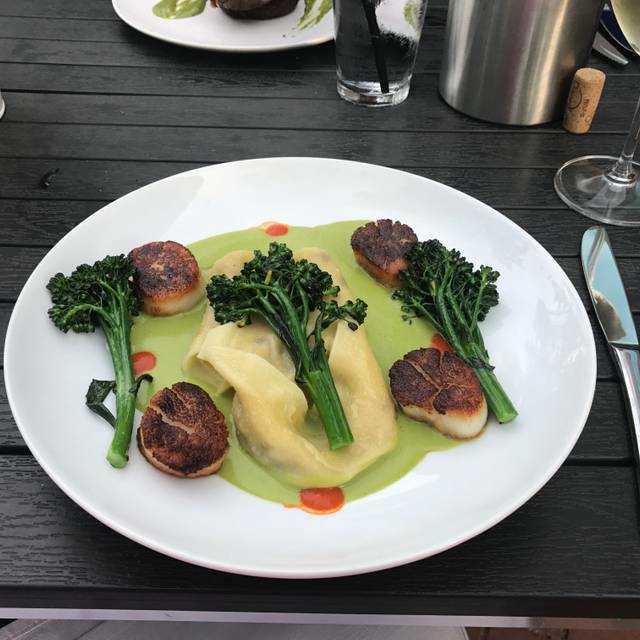 Scallops were delicious. Thought the prices were pretty high . Probably wouldn't go back. Love the patio, great atmosphere. Food is good but a little pricey for the area. We have been several times service is usually okay but this time it was terrible.